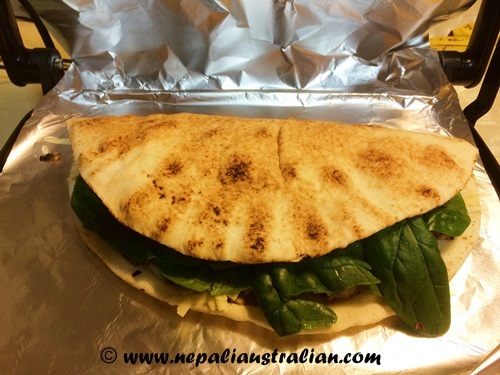 I think a while ago, I have told you that I am a big fan of gozleme (a savoury traditional Turkish pastry dish, made of hand-rolled dough that is lightly brushed with butter and eggs, filled with various toppings, sealed, and cooked over a griddle). 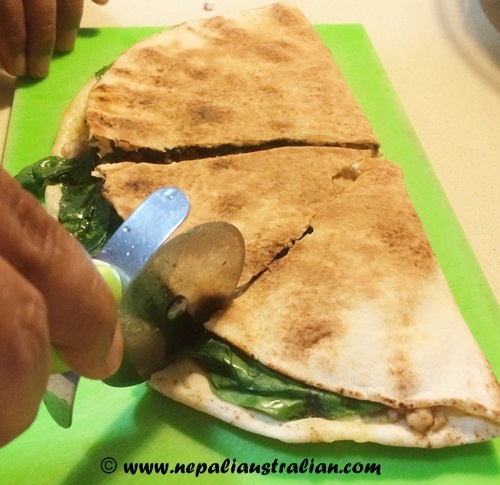 First I was thinking, I should make my own dough like them and but by the time I left work, I was tired and not ready to make it from scratch so I bought Lebanese bread instead. I am glad it turned out to be nice and both of us enjoyed our dinner. Heat oil in a frying pan over medium heat. Add onion and fry it until it is cooked. Add chicken mince, salt and cook, stirring, for 8-10 minutes or until browned. Place 1 bread in the press. 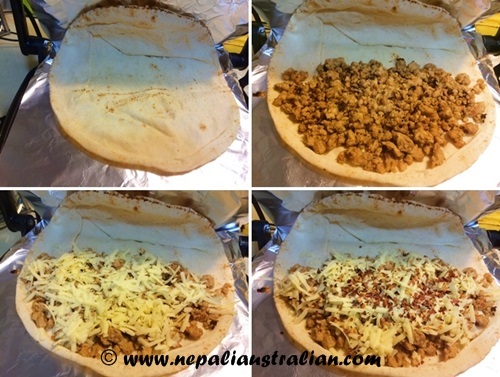 Spread chicken mixture over bread. 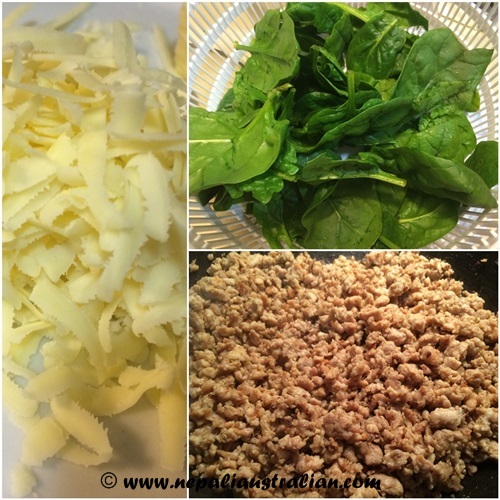 Then add cheese, chilli flakes and spinach on the top. Fold the bread and cook until golden. Stand for 1 to 2 minutes. Take care everyone, have a nice day. 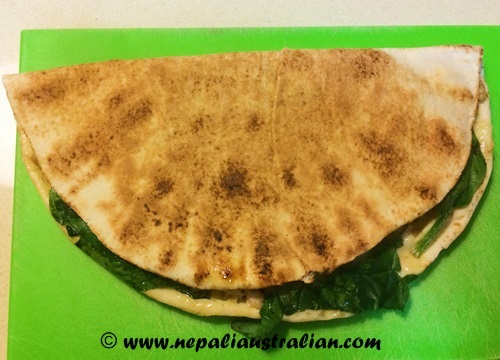 This entry was posted in Foodie, Recipe and tagged australian, cheese, Chicken, easy recipe, gozleme, Lebanese bread, M from nepaliaustralian, mushroom, nepali australian, Nepali blog, Nepaliaustralian, pasta, Spinach. Bookmark the permalink. 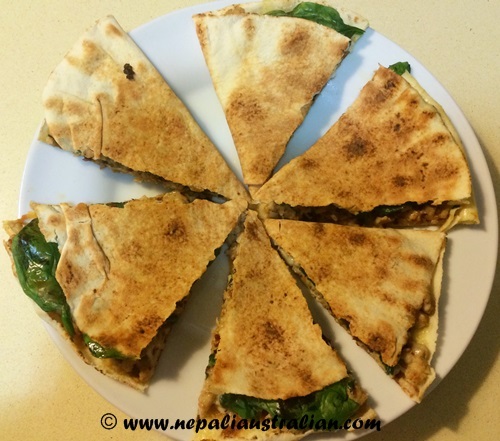 I like all the ingredients and would love to have some made for me, can you send it over? ha ha! Smiles! 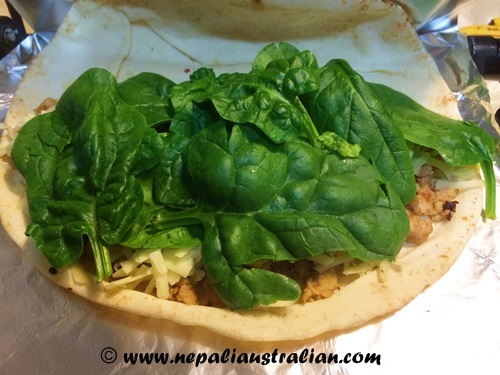 Hope you loved the veggi version.. they are super quick and easy.